LaGrange College aims to bring a bit of “magic” to its ninth annual 3D Journeys travel and lecture series. 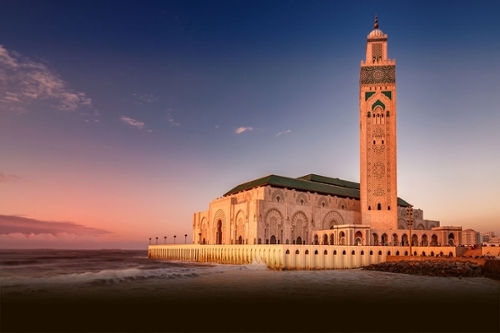 This year’s lectures and optional travel will focus on Morocco, a “magical land” of ancient cities, epic mountain ranges, sweeping desert, distinctive culture and legendary hospitality. The preview begins at 10 a.m. in the Dickson Assembly Room of Turner Hall. The session will introduce the lecturers and aim to provide a “tempting taste” of the topics for the monthly series that runs January - April, 2019. Details and rates for a spring 2019 trip to Morocco, hosted by President Dan McAlexander and Celeste Myall, will be presented, but travel is not required to attend the lectures, which drew an average of 90 people to each one last year. “Like all 3D sessions, the preview is free and open to anyone with an interest in learning, whether they prefer armchair travel or the ‘passport’ variety,” Beason said. Home to rose-hued Marrakesh, fabled Casablanca, lively Fez with its massive medina (old quarter) and the awe-inspiring dunes of the Sahara Desert, Morocco has become both a safe and popular tourist destination, said Steve Hart of Hart Travel Partners, who has previously organized 3D trips to Spain, Croatia, Cuba, Sicily and, last year, to five of the world’s great cities: Budapest, Bratislava, Salzburg, Vienna and Prague. The 2019 lecture dates and speakers are Duncan Sandys, great-grandson of Sir Winston Churchill, on Jan. 28; Dr. Kevin Shirley, history professor, on Feb. 25; Dr. Dottie Joiner, art history professor, on March 25; and Dr. Caleb Williams, exercise science professor, on April 22. Morocco is the first African nation and first predominantly Muslim country featured in the 3D series, noted Myall, who helped launch the program in 2010. She sees the Morocco trip as an opportunity to learn about a destination many Americans know little about. A Dutch-treat lunch featuring Moroccan food and other choices will be available at Pitts Dining Hall following all of the sessions. For additional information, call 706-880-8244 or email 3DJourneys@lagrange.edu. 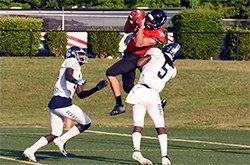 The Panthers (0-2) lost 34-21 to Berry last Saturday at Callaway Stadium. Senior quarterback Kelly Hall threw for 402 yards and two touchdowns. LaGrange hosts Apprentice on Sept. 22. 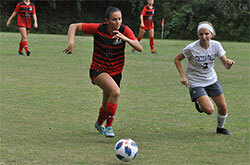 The Panthers (2-2-1) beat Toccoa Falls 3-1 on Tuesday. Junior Maura Webb put LC ahead to stay with her first collegiate goal. The Panthers’ home games this weekend with Greensboro and William Peace were canceled because of Hurricane Florence. 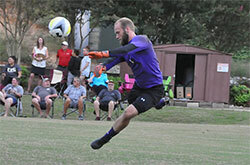 The Panthers (3-1) defeated Toccoa Falls 4-2 on Tuesday. Adam Curry’s goal in the second half broke a 1-1 tie. LC’s games at Averett and Greensboro were postponed until Oct. 20-21 because of Hurricane Florence. The Alumni Executive Committee held its first meeting last week for the 2018 academic year, making plans for #GivingTuesday and welcoming new members Becky Johnson Loveless ’10 and Corey Morgan ’17. 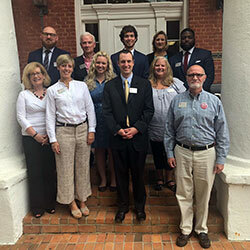 AEC members shown are, from left: front row, Loraine Medlock Anderson ’83, Laura Dean ’00, Becky Johnson Loveless ’10, Spencer King ’00, Diane Hollis Harrell ’89 and John Harrell ’93, M’17; back row, Andrew Cantrell ’09, Jimmy Motos ’68, Hank Barnes ’17, Jane Cooley ’83, M’84 and Corey Morgan ’17. Don’t forget the “Pounce Around Town” event from 5:30 – 7 p.m. Thursday at Beacon Brewing Co. at 700 Lincoln St. in the Hillside community. The LaGrange Panthers vs. Apprentice Builders (Newport News, Virginia) pep rally will feature snacks and the choice of a Beacon’s beer. All alumni are welcome, and the first 20 attendees will receive complimentary tickets to the Panthers football game against Apprentice on Sept. 22. For more information, contact alumni@lagrange.edu or 706-880-8244. Troup County Elections Supervisor Andrew Harper will be this year’s Constitution Day speaker at 11:15 a.m. Tuesday in Dickson Assembly Room. He will answer student questions about voting, while undergraduate Jamarcus Watkins will speak about the importance of voting and Dr. John Tures, Professor of Political Science, will help answer questions for students who are registered in other counties and states. More than 145 students, faculty and staff attended a 9/11 presentation by undergraduates Brandon Collins, Mimi Loftus and Robert Allen, with a discussion led by Dr. John Tures. Campus chaplain Adam Roberts and undergraduate C. J. Lord, as well as First United Methodist Church Pastor John Beyers closed the event with a prayer for peace, unity and healing.